Clemson University Cooperative Extension Service will offer a 2019 Dicamba Use Program Monday, February 11th, 2019 in Lee County. 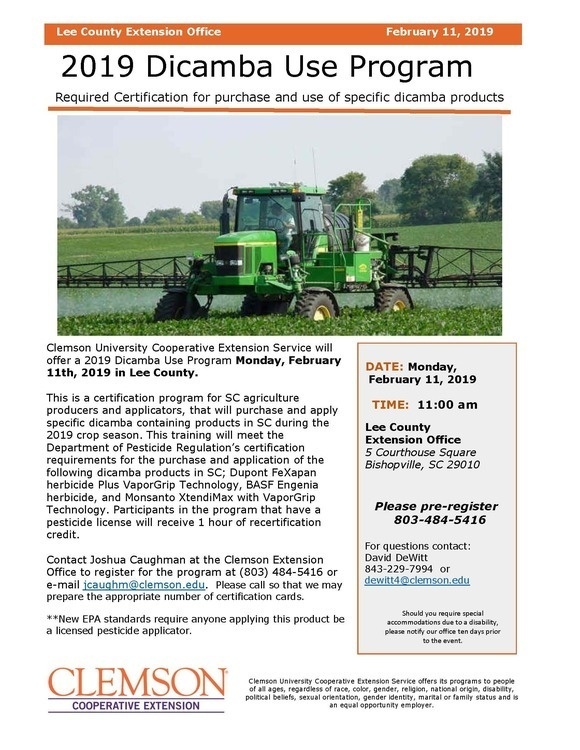 This is a certification program for SC agriculture producers and applicators, that will purchase and apply specific dicamba containing products in SC during the 2019 crop season. This training will meet the Department of Pesticide Regulation’s certification requirements for the purchase and application of the following dicamba products in SC; Dupont FeXapan herbicide Plus VaporGrip Technology, BASF Engenia herbicide, and Monsanto XtendiMax with VaporGrip Technology. Participants in the program that have a pesticide license will receive 1 hour of recertification credit. Contact Joshua Caughman at the Clemson Extension Office to register for the program at (803) 484-5416 or e-mail jcaughm@clemson.edu. Please call so that we may prepare the appropriate number of certification cards. **New EPA standards require anyone applying this product be a licensed pesticide applicator.